Marin Piano Studio has great students, parents and community! Here are reviews from Facebook, Yelp, and many other sources. 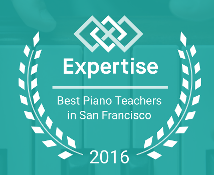 Read on to see what everyone is saying about Marin Piano Studio! Can Mrs. McLean be my piano teacher forever? I love everything about my piano lessons! My favorite part of the day is my piano lesson! I love my lessons with Mrs. McLean! She always has us do fun stuff! My daughter and son took lessons at Marin Piano Studio for 2 years until we moved to Oklahoma. My children, who were beginning and intermediate players, loved their lessons! Their teacher, Mae, made their lessons fun, and played games with them that also taught theory concepts. She fostered and encouraged their love of music and my children actually enjoyed practicing. She also had them play music note reading games on her studio iPad after their lessons, which was really great if I were running a little late to pick them up. I really liked the mid-week mini-lessons (separate from the children's regular lesson time) using FaceTime which Mae conducted each week with my kids at no additional charge. I have never heard of another piano teacher doing this. The mini-lesson allowed my children to ask any questions or have fixed any problems they might have with their pieces, kept my children motivated, made the whole process a positive experience, and resulted in my kids always being prepared for their lessons. They really looked forward to going to their lesson each week. My kids learned so much, from great technique and composing skills to mastering amazing piano pieces. We can't say enough good things about our lessons with Mae at Marin Piano Studio! Have some questions or want to talk?